In this case, the thrower was 11-year-old Brenden Hale. 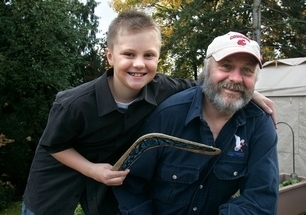 As reported by the Everett (Wash.) Daily Herald, Brenden tossed his boomerang into the air and it landed with a splash in the Skagit River in Mount Vernon. That was last June. Brenden thought it was lost forever. But lo and behold, it returned, just like those things are supposed to do. Never mind that the return trip was, well, far more adventurous than return trips are supposed to be for boomerangs. Last month, Brenden went duck hunting with his grandfather on the family property at Skagit Bay when he noticed a crusty-looking piece of wood on the beach. Of course it was the boomerang. Brenden recognized it by a notch on the back. It had floated down river 10 miles to where Brenden found his prized possession. A weird state law: You can’t fish with your what?